looking good, especially picture 12. Tree's look great! No, really! They really look great! I'd honestly buy it for the trees alone. What? I'm not mad. I've just been waiting for good trees for a while. OK, I may be a little silly. Hey, that's how my Fiancé works out if she likes a driving game or not, the damn trees! This will be a first day purchase for me, whenever that is! Tis Gorgeous. best looking racer overall, GTP has better car moddles but no damage to cars or good looking environments. GRID is just awesome in whole. Great graphics, the replay camera is AMAZING, sounds need some work. Unbelievable graphics, but thats about it. And that 1 screen that shows the formula style cars.. Wow.. is that in the game too!? 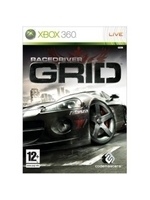 Goodbye Grand Turismo, PGR, and Forza; hello Grid! granturismo and grid in the same bucket ? It ain't no Forza beater but it makes a pleasant change. They both run at 30fps fool, so i don't know what game specs you've been reading. Not reading any game spec, Going off MY own trial of the game FOOL. There is distinct slow down on the PS3 version on the American level which isn't there on the 360 version. So go read all the spec's you like you muppet, I'm going off my experience of the game.